Buffalo Rising is an exciting video slot from Blueprint Gaming that has the Megaways game engine licensed from Big Time Gaming. This presents players with a staggering 117,649 ways to win, across a fast-paced slot game. The game is jam-packed with Free spins, increasing multipliers and cascading reels, providing a fun, yet volatile gaming experience. Give Buffalo Rising slot a go for free right here in this free play game. There is no need to register or place a deposit. Simply click to play and you are off. Then you will get a chance to experience this slot without the need to spend money. Once you get your head round how all the features work and what the key symbols in the game are. Just like other Buffalo slots, such as Buffalo Magic and White Buffalo, it is always good to play them for free first before wagering any money. 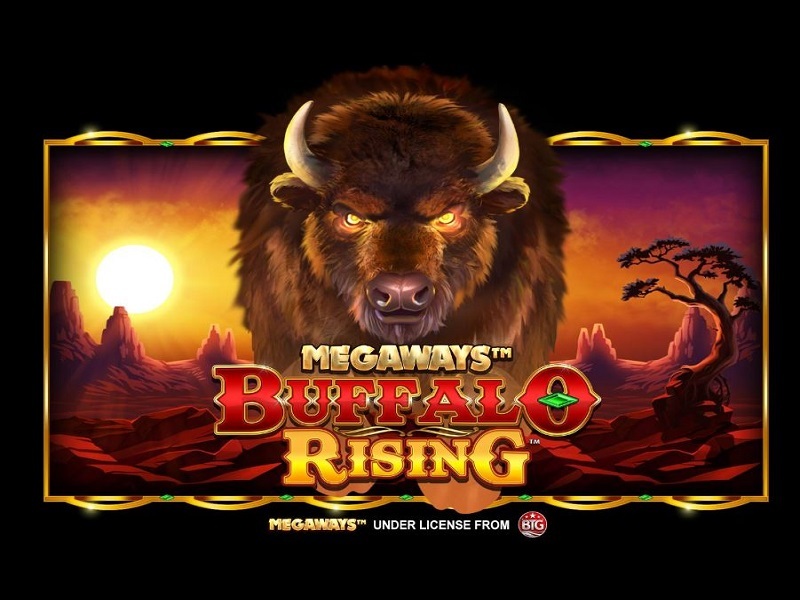 Buffalo Rising slot utilizes the ‘Megaways’ License from Big Time Gaming. This results in a slot mechanic based on the famous Bonanza game, but here the theme is based around North American animals and as a result we play to some meaty Indian music with the prairie as the backdrop. The animals do chip in though with their respective roars or calls when they appear in a win! Megaways slots always have 6 reels with a moving scroll of 4 symbols either above or below the centre four reels. The reels change each spin in from between 2 to 7 rows each . The possible ways therefore vary from 324 to 117,649 each spin and this can be quite rewarding as the symbols appear stacked so hundreds of ways are possible of winning symbols. Wilds will only occur in the scroll of 4 symbols with scattered Pink Diamonds available on all reels. The line pays are identical to Extra Chilli, Bonanza or Diamond Mine, the Buffalo being highest at 50x bet for a way of all six. When wins occur, the winning symbols vanish from the reels with more cascading down from above to replace them. Randomly you might see stacks of Sunset icons on one or more reels which are a mystery reveal so will all show the same symbol bar Wilds or scatters. You trigger the free games with 4 Pink Diamonds which award 15 free spins with an increasing multiplier for each winning cascade. Any triggering scatters over 4 give you 5 extra spins each. You can retrigger too if you see 3 or 4 Diamonds in the top scroll during the spins, with 5 spins for 3 or 10 for 4. The multiplier is unlimited and increases once for each winning action. You can also choose your own volatility with 3 options when the bonus is triggered or bought for 100x bet – 15 spins starting at 1x, 10 starting at 5x or 5 commencing with a 10x multiplier. On some versions you can pay 5x your selected stake to operate the increasing multiplier in the base game as well, rising 1x for all consecutive actions during a single base game spin. If this triggers the bonus, you begin your feature with the multiplier at that point carried over. Buffalo Rising slot has a RTP of 96.43% and is a natural result of another developer using an existing mechanic under license, whereby they will need to vary the model or add something to it. Blueprint certainly have here but underneath you re still essentially playing Bonanza which is no bad thing, givent he popularity of that slot. Instead of the banjo, Buffalo Rising has the tribal drums but retains the same excitement and huge winning potential. Utilizing Big Time Gaming’s widely enjoyed Megaways game mechanic, Buffalo Rising delivers a staggering 117,649 ways to win on each spin and every spin. This online slot provides a huge range of winning opportunity, as well as an exciting free spins feature, increasing multipliers and cascading reels.